The Big Honzo from Kona has made a name for itself as being a flexible 27.5 plus hardtail platform for many different riding styles. The new 2019 lineup expands the Big Honzo range to include Carbon Fiber, Aluminum and Steel options. It’s not often that you will find a platform offered in that many frame materials. 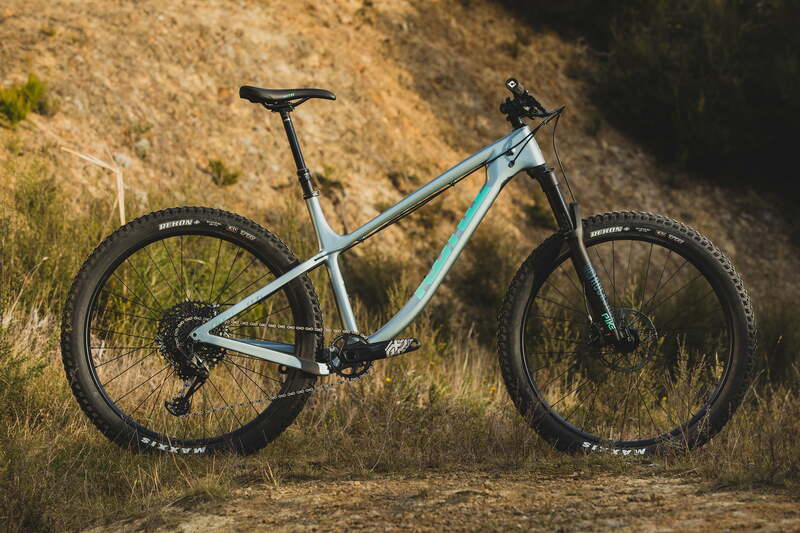 The 2019 bikes also expand the front travel, as is popular right now, from 120mm to 130mm. This additional 10mm of travel slackens out the head tube angle from 68 degrees to 67.5 degrees. Kona has adjusted the geometry to keep the bottom bracket at the same height as last year’s model. So you don’t have all the same tradeoffs you encounter when up-forking a 120mm bike. The Aluminum versions are the most affordable, starting at $1699. This gets you a SRAM NX drivetrain and a Rockshox Recon Solo RL. While not a bargain basement offering, it is a respectable build kit. The steel version comes in a single build at $2399 with an upgraded build kit from the base aluminum version. You can also get the steel Big Honzo as a frame only, if you wish to build it up yourself. The carbon Big Honzo builds start at $2999. This is arguably getting into the same price range as some pretty nice full squish bikes. However a full squish bike isn’t for everyone. Bikepackers and those wanting less complexity in their bike may want to give the Big Honzo from Kona a look, even in these more expensive options. All versions of the bike come with a dropper seat post, which I applaud Kona for including. Removing the dropper from a hardtail may make the price-tag a bit lower, but even a beginner buying their first bike can benefit greatly from a dropper post, so including it makes sense. You can find out more about the builds over at Kona’s website.